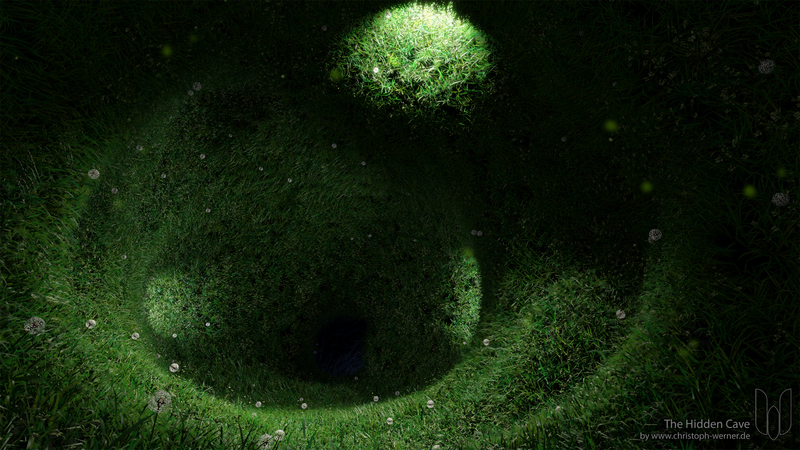 Another day – another artwork… I have found this nice free Blender AddOn called Grass Free. You can create multiple kind of grass plants by using particles. After some tests I’ve ended in this nice scene here. Creating particles is really easy and makes a lot of fun in Blender, even hair. This Addon brings a lot of nice plants and renders very fast at a nice look. Grass Free is perfect for masses of plants and limited for camera close ups. But you can change the plant models if you want and create new for your needs. Mushrooms modeled by hand and used a subsurace modifier. Vertex colors used for the texture. Grass created with particles and Grass Free Addon. No lights used. Just environment lighting and a blue emission material inside the cave in the image center. Artworks, blender, Blog, personal, persönliches, render, rendering. Lesezeichen.